Home Companies Zhejiang Aoxiang Auto-Control Technology Co., Ltd.
petroleum, chemical industry, pharmacy, food, electricity, coal gas, pro~environment, metallurgy and paper making etc. A three-dimensional position indicator to clearly show the location of the valve. 3-wire interface Dual 1/2 NPT pipe interface. 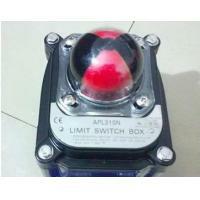 5 Switch position indicator can be clearly identified. can be quickly adjusted without tools. 8 with the PCB replace the wiring to prevent short circuits. IICT6, compliance with EN50014 / 50018 standard. 10 pairs of wiring ports, standard contacts, wiring safe and convenient. stents, any rotation of the actuator can be easily installed by. 12 anti-off bolts, bolts removably attached to the cover when not fall off. 13 easy to install, stainless steel shaft and mounting brackets are in line with NAMUR standards. 15 exterior coating: Polyester coating (black). 16 stent material can be selected SS304. 17 standard and explosion-proof type two. NAMUR standard stainless steel shaft and bracket.